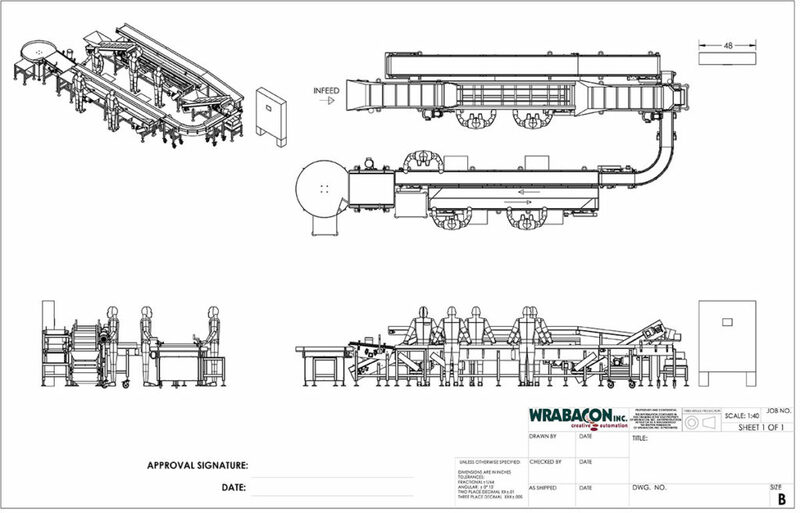 Wrabacon was tasked with designing and manufacturing a series of conveyors that transport filled plastic containers from two existing fillers to two existing spot pack machines. 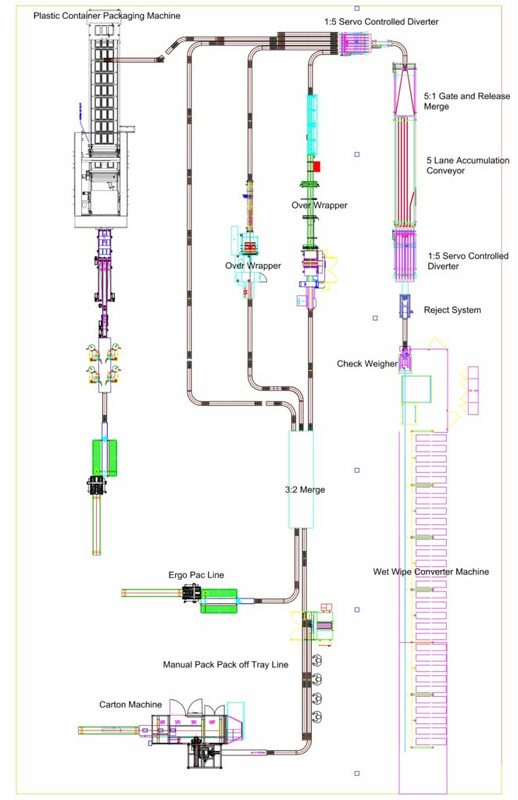 The system needed to be designed so that each filler can feed each spot pack machine utilizing reversing belts. The containers will be produced at the rate of 180 per minute per filling machine. After the spot pack machine, spot packs need to be elevated and fed into a new palletizing line at the rate of 30 packs per minute. Wrabacon developed a custom design for the client. 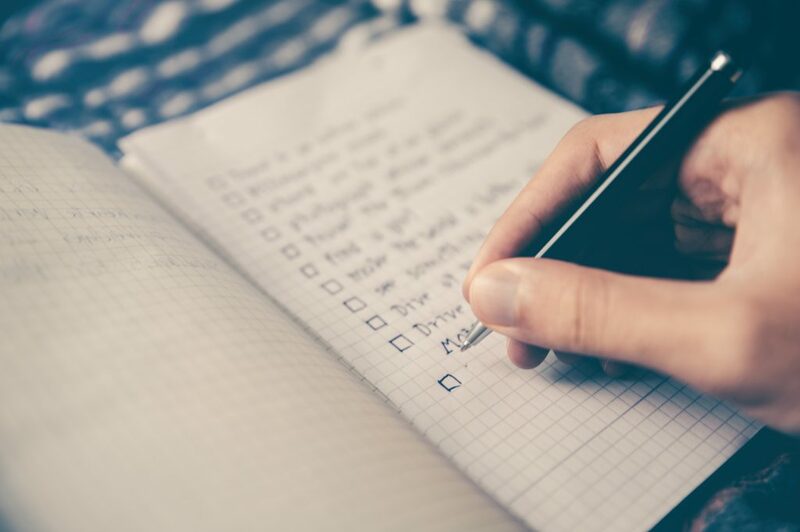 The system will be produced in phases, with phase one to include the conveyors from the existing (right hand) filler to the existing spot pack machine. Phase two will include the conveyors from the new (left hand) filler to the new spot pack machine as well as a product elevator and conveyors to feed spot packs to the recently purchased palletizing line. Also included in phase one will be the addition of a new labeling conveyor prior to the inclined conveyor on the recently purchased palletizing line. In normal operation, the containers will transfer from the two fillers, onto their own conveyors. The left hand filler will feed the left hand spot pack machine and the right hand filler will feed the right hand spot pack machine. 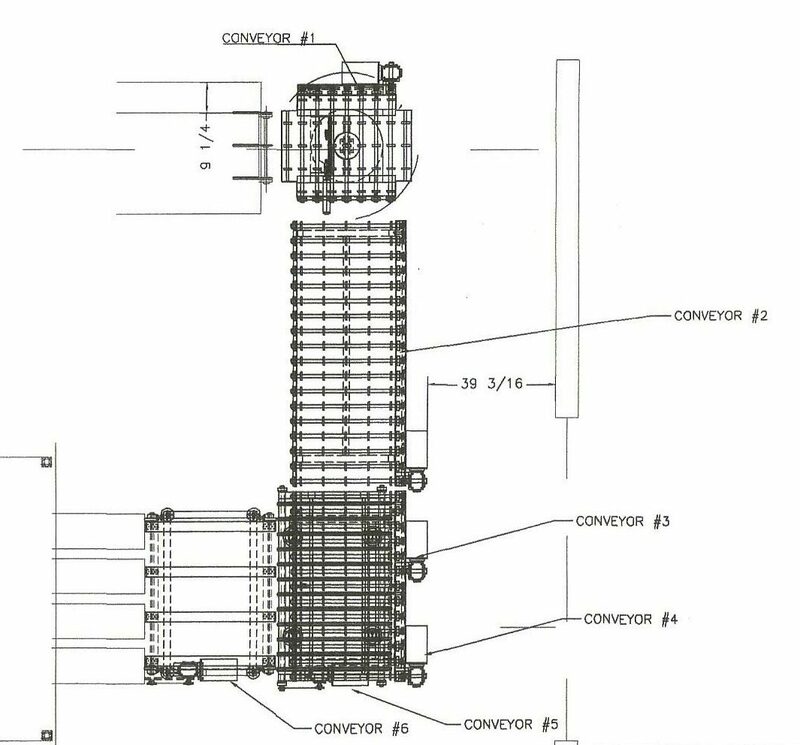 The two filler discharge conveyors will be reversible as well as the conveyor that connects the two. When both fillers are running, they will feed the two corresponding spot pack machines. When only one filler is running, the belts can reverse direction so each filler can be used to direct the product to either spot pack machine. During normal operation, the containers will travel downstream through two metal detecting conveyors. If both fillers are running the containers will be passed through the corresponding spot back machine. Then onto conveyors which feed either the existing palletizer or a new palletizer as noted in the drawing. 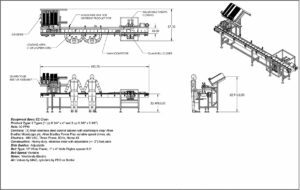 Equipment supplied by Wrabacon on this project includes conveyors from each filler to the one existing pack machine, a new pack machine, conveyors and an elevator to direct product to the new palletizer. New England farmed oysters are becoming a major market for fisherman who are dealing with the loss of species in local waters. In fact, New England waters are the perfect environment for the growing and harvesting of farmed oysters. 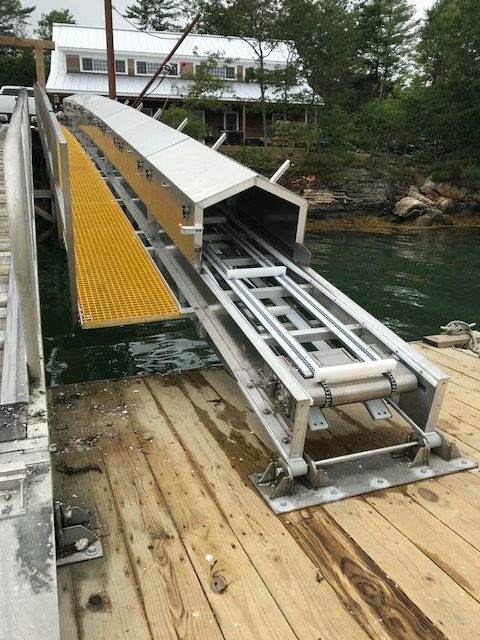 A prominent aquaculture farm contacted Wrabacon Inc. to design and build 3 special conveyors to transport 80 pound wire mesh crates from a dock, up an incline, to an existing pier and then up a second incline where they will be manually removed, palletized and moved via fork truck to the refrigerated warehouse. The conveyor from the pier to the dock was manufactured with a special pivot point on the upper end to allow the conveyor to pivot up and down with the dock with the rise and fall of the tides. 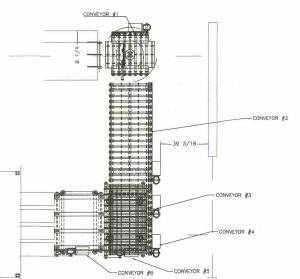 Included in the design and manufacture of the conveyor are covers over the conveyor along with a 24 inch walk way parallel to the conveyor. The conveyor measured 50 feet long by 30 inches wide with a special stainless steel attachment chain with 2 inch tall lugs attached every 48 inches. The second and third conveyors are designed to transport the crates to the palletizing area. 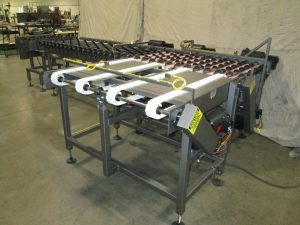 Both conveyors are built in heavy duty aluminum and measured 21 feet and 25 feet, respectively. All three conveyors had their own stainless steel cabinet with variable speed drives.